I trust you`re all doing well. The other day in the morning I mentioned to my companion that his hair was getting a bit long. He thought so too so asked if he could borrow my haircutting kit. I helped him out at first but he said he always cut his hair back home and would be fine. I went back to my desk to write in my journal when I heard a shout come from the bathroom. `Oh no. 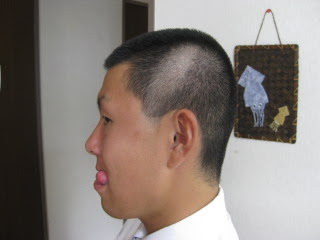 I made a mistake.` I went to the bathroom to see he had cut a patch of hair ridiculously short. 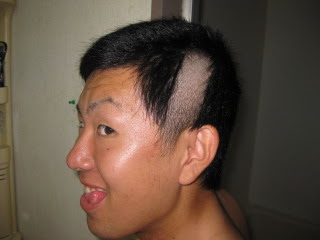 He accidentally used the hair clippers backwards... I then tried to fix his hair the best I could. His hair is pretty short right now but it should grow back soon. What else happened this past week... Some random nice old man in a park gave a Melon bread. Oh yeah, church was canceled this past Sunday in our ward. 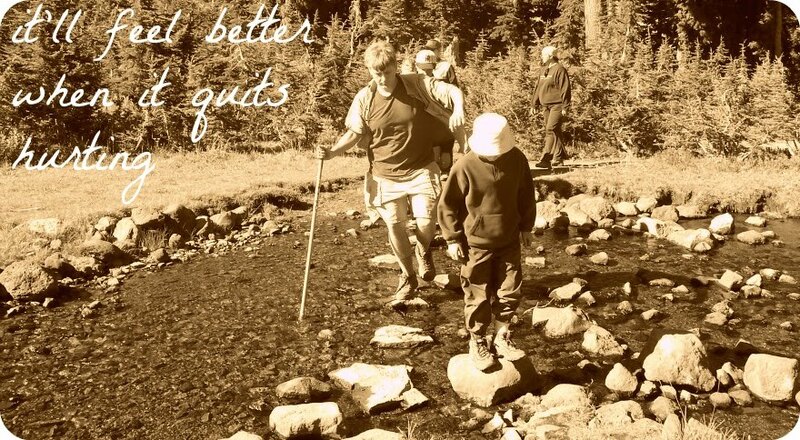 Some scout troop went up to Mt. Fuji last week but some of them ended up getting sick, maybe with the pig flu and came home. A couple other members may have possibly gotten sick, I don`t know. Anyways we ended up going to the other ward`s sacrament meeting, it`s closer to our apartment anyways. I was trying to think of pictures to include in the email but I couldn`t think of many so there`s just the before and after shot of my companions haircut as well as the cockroach traps. I hope you enjoy the pictures.Well that`s all I have time for this week. Tomorrow is transfer calls, it`s crazy how short the transfers are. Seriously bad cut. But two weeks and no one will be able to tell!